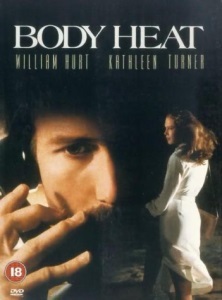 In the midst of a searing Florida heat wave, a woman (Kathleen Turner) convinces her lover, a small-town lawyer (William Hurt), to murder her rich husband (Richard Crenna). Re-watched this over the holidays and damn... what a movie. What an amazing film this was! A true film noir (though in color), with Hurt in what I think was his best role ever as the incompetent lawyer just waiting to be taken. It was also the height of Mickey Rourke's comedic career (along with his next film, The Diner, before he started taking himself too seriously. Turner is fantastic, and you can literally feel the heat coming off the screen. Wait, I do have something else to add! I can’t watch the film right now, but I’m pretty sure that there’s an easter egg on the outside of the building that Rouke’s character lives in, and at the time of writing it isn’t on the IMDB trivia page - so perhaps I’m the only person to ever spot it!! Inspired by this post, I re-watched the movie (I'd seen it several years ago but didn't remember a lot of the details). It's so... suffocating. The sweaty customers packed into the diner, the sleazy bar full of jealous men panting after Turner's character, the dingy Italian restaurant, the haziness and soft focus of the images, the heavy smoking by everyone except Ted Danson throughout the movie, the fog in every night scene*, everyone's clothes sticking to their bodies all the time (there being no escape from the heat anywhere because for some reason nobody has functioning air conditioning), and of course the way the sexual pull between Hurt's and Turner's characters becomes something more cloying and menacing. It all contributes to the feeling - that a lot of classical Hollywood noir has - of taking place in a dream state. And it's interesting how the first scene with Mickey Rourke (when he shows how to use the incendiary device) stands out from this. It has a feeling of sharpness and lucidity to it that really cuts through the miasma of the rest of the film. The contemporary rock music on the radio and the clear-headed advice that Rourke offers make it feel like we've briefly been pulled back into the real world. Hurt's character is being offered a moment of moral clarity which he will reject in favor of descending back into the mire. It even looks different from other scenes -- optically it just looks more clear and sharp, without the haziness and soft focus we've become accustomed to up to that point. *In reality the south coast of Florida is almost never foggy during the hot months due to the almost constant sea breeze. Apparently the original location was set to be New Jersey. Then various labor issues nixed that for production so they moved it all to Florida. I can't imagine it any other way, so who knows what THAT version would have felt like.